Content by Tony Macklin. Originally published on August 7, 2011 @ tonymacklin.net. Rise of the Planet of the Apes is a gripping test of anxiety. Those who have seen the previews know that the apes launch an attack on the Golden Gate Bridge in California. How far will they go? What will set them off? When is it all going to hit the span? 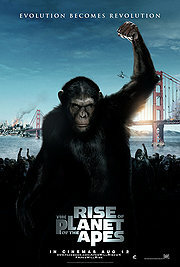 Rise of the Planet of the Apes is a prequel to Planet of the Apes (1968), and it is a worthy companion piece. It's the tale of Will Rodman (James Franco), a scientist who is working on a new drug to counter Alzheimer's. When his research is halted, he takes a small chimpanzee -- whose late mother was a test subject -- home with him. Caesar, the chimp, begins to show remarkable intelligence, which is the result of his mother's trials. Will's father Charles (John Lithgow) also takes the drug and undergoes an incredible recovery from the dementia that was plaguing him. But Charles has a relapse, and Caesar gets into trouble, which causes him to be sent to a primate refuge that proves not to be a refuge. Caesar is denigrated by the chief (Brian Cox) and tormented by his son, a young punk (Tom Felton). It's only a matter of time until revenge rears its simian heads. How ape-spit will they go? The audience may not know exactly how hard to root for the awry apes, since the human race could face annihilation. Caesar seems like a good guy, but so was King Kong. At least these authorities only have a helicopter. Rise of the Planet of the Apes is like many summer movies -- once you get on their wave length, they're a hoot. But as with Cowboys & Aliens, you have to accept the bumpy amusement ride. As with Daniel Craig in Cowboys & Aliens, Rise of the Planet of the Apes is given credibility by a likeable leading man. James Franco utilizes a lot of looks of serious concern mixed with an occasional flash of a winning smile as Caesar's adoptive parent. Much has been made of Andy Serkis as Caesar in motion capture suits giving the chimp a presence that is compelling and appealing. His technique works wonders. Frieda Pinto is along for the ride as the pleasant vet, and Lithgow is convincing as the anguished father. Director Rupert Wyatt knows he has some splendid effects. The CGI is Chimpanzees, Gorillas Infinitum. There's also a smart orangutan Maurice (Karia Konoval). Wyatt puts his effects through their soaring paces. The screenplay by Rick Jaffa and Amanda Silver doesn't get in the way. One can imagine the pharmaceutical companies advertising for the new Alzheimer's drug. The tv ads would have lilting music, accompanied by the words "fresh," "clean," "natural." And in minuscule small print, "It may kill you by contact."